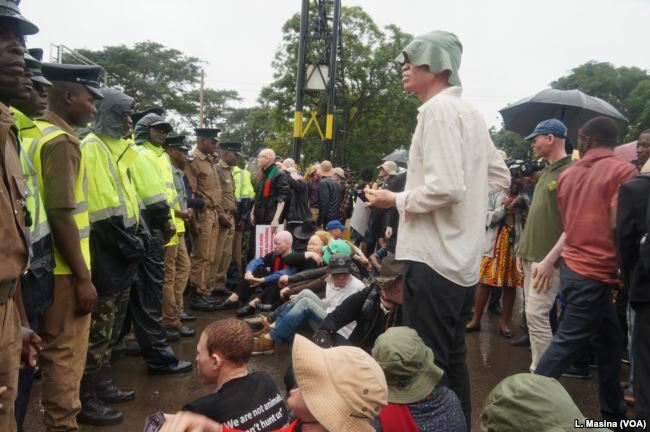 About 300 people, most of them albinos, have braved steady rains this week – sometimes bringing traffic to a standstill – to protest near the residence of Malawi’s president, Peter Mutharika. 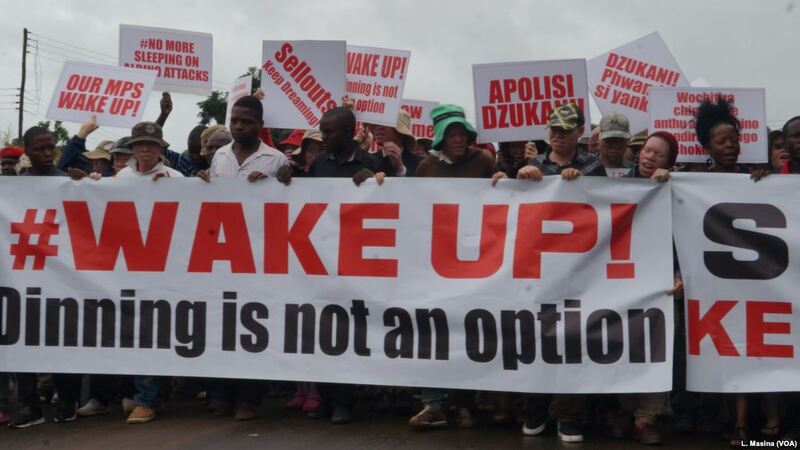 The demonstrators want a face-to-face meeting with the president to discuss the continued killings of albinos in the southern African country. Ian Simbota, an official with the Association of Persons with Albinism in Malawi, which organized the protest, laid out the protesters goals. “We have several demands. One of them is that we want the president to institute a commission of inquiry which must make sure that it exposes the people behind the albino bone sales, because this problem is still continuing, because we haven’t managed to kill the market, but if we kill the market today, that would be the beginning of the end of our problem,” Simbota said. The protesters tried to march on Mutharika’s residence but were turned back when police mounted a human wall about 200 meters from the front gate. Authorities said they could not allow a protest at State House because it is a protected area. Simbota, speaking for the protesters, said the blockade was unfair. “If the president fails to safeguard our right to right and security, he must just come out and declare Malawi not safe home for persons with albinism. Then we should seek asylum somewhere because he has failed us,” Simbota said. Albinos in Malawi are targeted over false beliefs that their body parts, when used in so-called magic potions, bring wealth and good luck. Police statistics show that 26 albinos have been killed since 2013, including three in the past two months. More than 100 albinos, some of them children, have faced abductions, with some deceased having their bodies exhumed. Hetherwick Ntabal, the chairperson for the Presidential Committee to Protect Albinos, told VOA that the attacks are a complex issue, which should not be left to government alone. He noted that some of those arrested in connection with the attacks are trusted members of society such as priests, police officers and traditional leaders. “Now, if a clergyman, a policeman and a village headman are involved in such atrocities, who can we trust? Not even the fathers or mothers. 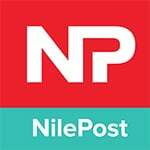 It is a tragedy for all of us to address,” Ntabal said. As of Thursday, the protesters were camping out at the Malawi Institute of Management, about six kilometers from the State House, waiting for the president to return from a visit to the north.